Written by leading experts, this innovative textbook offers a case-focused, comprehensive, and engaging account of EU law for students of all levels. • Draws together the leading voices in EU law, providing you with access to a range of perspectives to inform your studies. 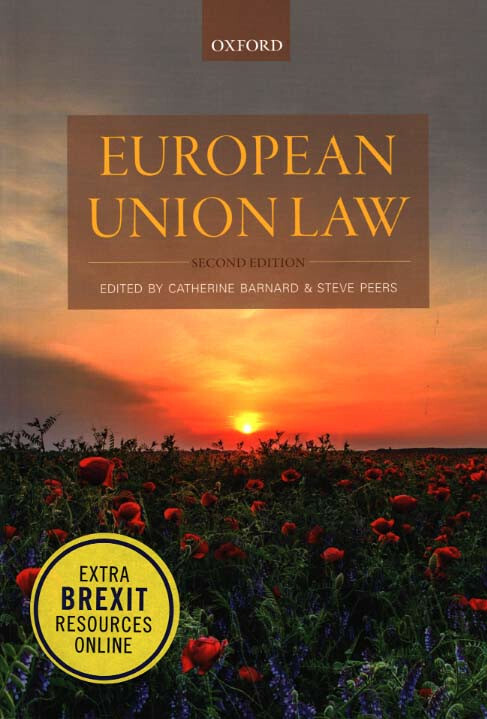 • Includes critical case studies to develop your understanding of key issues, enabling you to assess and criticise the impact of those cases on the development of EU law. • A new Brexit chapter covers how the exit of the UK from the European Union will affect the UK and other Member States; the impact of Brexit is also highlighted where relevant in other chapters. The text is accompanied by a range of online resources - including downloadable diagrams and video clips, plus updates and blog posts from the editors - designed to support your studies and revision. Catherine Barnard is Professor of European Union Law and Employment Law at the University of Cambridge. She is also Senior Tutor at Trinity College. Steve Peers is Professor of EU, Human Rights, and World Trade Law in the School of Law at the University of Essex. Contributors: Albertina Albors-Llorens • Catherine Barnard • Michal Bobek • Kieran St C Bradley • Paul Craig • Geert De Baere • Leo Flynn • Leigh Hancher • Darren Harvey • Tamara K Hervey • Alicia Hinarejos • Herwig C H Hofmann • Geraint Howells • Alison Jones • Martin Martinez Navarro • Elisa Morgera • Niamh Nic Shuibhne • Peter Oliver • Steve Peers • Mia Rünnmar • Wolf Sauter • Robert Schütze • Jukka Snell • Eleanor Spaventa • John R Spencer • Christopher Townley • Bruno de Witte.